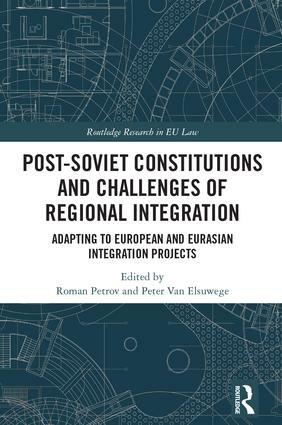 This book explores the implications of European and Eurasian integration projects for the constitutional orders of post-Soviet countries. On the one hand, the process of Eurasian integration, culminating in the establishment of the Eurasian Economic Union (EAEU), led to the creation of new institutions and mechanisms influencing the domestic legal order of the participating countries. On the other hand, the process of European integration, epitomised through the European Union (EU), constitutes an important source of reference for domestic constitutional developments in the countries which recently concluded a new generation of Association Agreements with the EU. This book analyses the implications of both processes. The book addresses the relevant experience of the countries from Central and Eastern Europe with transitional constitutionalism, mapping out the significance of European and Eurasian integration for protecting the rule of law in the post-Soviet space and identifying the constitutional implications and challenges of the EAEU and the new generation of Association Agreements. It also provides detailed country reports on national constitutional orders in the post-Soviet space and their adaptability to regional integration projects,　authored by leading academics from the countries concerned, providing a number of general reflections about the evolution of post-Soviet constitutions in light of European and Eurasian integration projects. Roman Petrov is Jean Monnet Chair in EU Law at the National University of 'Kyiv-Mohyla Academy', Ukraine. Peter Van Elsuwege is Professor in EU Law at Ghent University, Belgium.